In the spirit of showing what I do with stuff rather than just how to make them, I thought I would share a few things that are almost completed projects using tools or techniques I’ve shared. 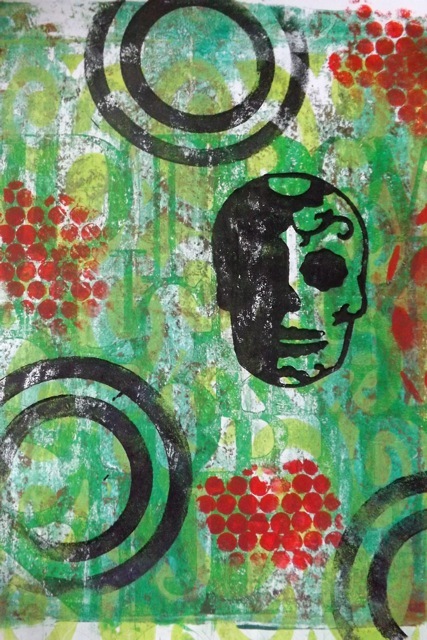 First, a Gelli print that uses a foam stamp I cut on the Cricut Mini from a cart image – the skull – as well as some circles I cut with dies. They are mounted on the cut up bits of plastic placemats as mounts. That one has the mask, the foam letter stamp cut using the QuicKutz die plate, and printing then embossing on to washi tape. Now this. Grrr. It turned out SO well (at least to MY eye) that I so wish I had pulled it on to a canvas I have kicking around on the side of my desk. It has just the look I wanted, like a grungy old painted and repainted wall, with graffiti on it maybe. I just don;t think it would look any good in a frame, but I bet DS would like it. I thought of maybe sticking it to a canvas but it’s not QUITE the right size, and I am not keen to risk completely ruining ti thru experimentation. The image is actually cut from another print – perhaps as close as I am likely to get to “collage” – so I just do not know. Suggestions? Just stick it to the canvas and do something to hide the edges? Deli paper prints maybe, or simply paint and ink?? I really do need to come up with something USEFUL to do with all my prints. 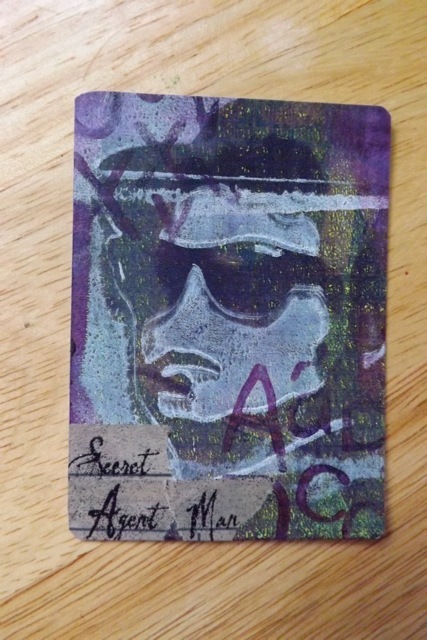 I can make endless mini-books, and a gazillion ATCs for sure, but I crave functional use. and since I can’t make myself art journal no matter how hard I try, what the heck do I do? 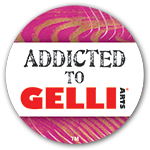 Categories: art, Gelli plate monoprints | Tags: art techniques, ATCs, Gelli, Gelli plate, Stencil | Permalink. Is it glicee or something like that? too lazy to google but I know what yo are talking about. It never occurred to me to scan it, but it makes me thing perhaps the water slide decal paper might be a way to try the idea of sticking it to canvas while letting me keep the original to be able to have a second go at one of the other ideas suggested (both good, which to choose???) if it doesn’t work as well as I would have liked. Something to explore for sure! Great prints. I think you should put it on a canvas. 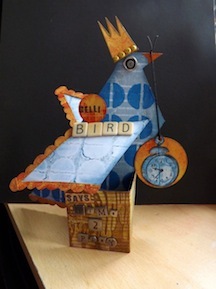 Paint the canvas including sides then collage with gelli prints then adhere it on top. Beautiful. Thanks for sharing these. Can’t wait to see what you wind up doing. Wow, that came out great. I would adhere it to a canvas and mask it off and try to recreate the same color blues to finish the canvas edges at the very least maybe creating a double border with one at the edge of the print and the other the canvas edges. Great job! 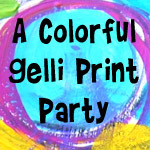 I also know the gelli print “what the heck do I do with all theses prints now!” Thinking of a journal with only pretty flowers, birds and scenes on gelli print backgrounds and 1 or 2 words max.